TV News: Even More Twin Peaks – The revival season will now have 18 episodes. Only a few weeks ago it seemed the Twin Peaks revival was in danger when David Lynch publicly announced that he had left the project. But a lot can happen in a few weeks (as the fans who know the timeline of the original series can attest)! Lynch is back, and now it seems we’re going to get more Peaks than expected! Originally planned to be nine episodes, the (very) long-awaited third season of the supernatural drama will be doubled in size to eighteen episodes, according to series stars, Sherilyn Fenn and Sheryl Lee. The actresses, who portrayed Audrey Horne and Laura Palmer in the original series, revealed the information during a Twin Peaks‘ panel at Crypticon in Seattle, last weekend. Also announced by the two stars during the panel, was that Twin Peaks‘ original composer, Angelo Badalamenti, will return to compose new music for the revival. 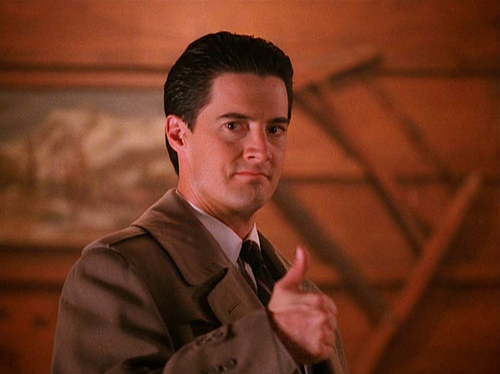 Get excited… The new series of Twin Peaks is set to arrive to Showtime in 2016!